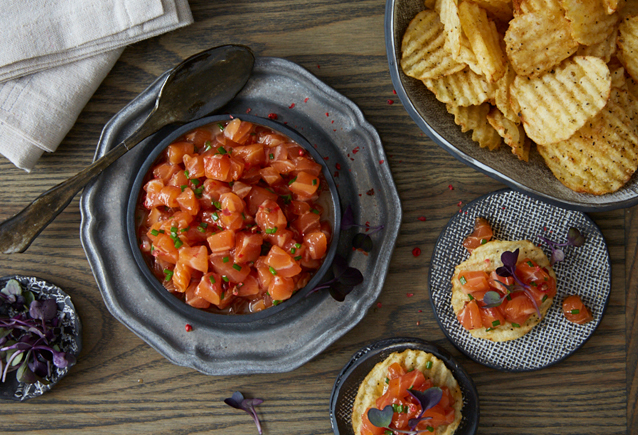 This salmon tartar is a beautiful and simple way to serve your favorite salmon. Be sure to freeze the salmon filet, tightly wrapped in plastic wrap for at least 8 hours. Thaw slightly and chop while firm! We love serving it on potato chips but crackers, toasts or wonton chips are equally delicious! Dice the fish by first slicing in ¼-inch slices. Next, cut those slices into ¼-inch strips and lastly into ¼-inch cubes. Place the diced fish into a medium mixing bowl. Add the peppercorn, mirin, soy sauce, and chives. Pour the dressing over the fish and mix well, but gently, to incorporate all of the ingredients. The tartar is ready to eat immediately, but can hold up to 4 hours in the refrigerator. Place the tartar in a large bowl and lay the radish sprouts over the top for garnish. Serve on artisanal kettle potato chips with Bonterra Dry Muscat.